The Anambra State chapter of the Nigeria Labour Congress on Friday asked the Federal Government to declare a state of emergency on workers’ welfare in the country. Addressing the press in Awka, Anambra State capital, to mark this year’s “World Day for Decent Work”, the NLC chairman in the state, Mr Jerry Nnubia, said the emolument of the Nigerian worker had been diminished by prevailing circumstances in the country. He said the Nigerian worker was the worst hit in the recession the country is passing through. He said in a recession, increasing workers’ emolument should be one of the first concerns of government. “Looking at the cost of living in the country, the worker is the worst hit. Goods and services are hitting the rooftops each day, while the worker is paid slave’s peanuts. “It’s pitiable. No health scheme for the worker. This increases preventable deaths among workers. “A state of emergency should be declared on workers’ welfare in this country. That’s one sure way to get it right. 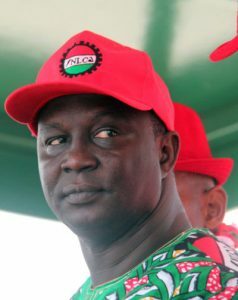 “Remember, we’re only talking about salaries; we’ve not talked about the working conditions of the Nigerian worker which is nothing to write home about”, the NLC chairman stated. He called for a speedy approval of a new minimum wage for Nigerian workers to cushion the effects of the recession on this class of Nigerians. He commended the state governor, Chief Willie Obiano, for his sincerity of purpose in handling workers’ welfare, especially his regular payment of workers’ salaries.